For several years now, I have been reading The Nester’s blog. Her thoughts on simple decorating are encouraging —- even I can create a little beauty around me with a few minutes and a little effort. 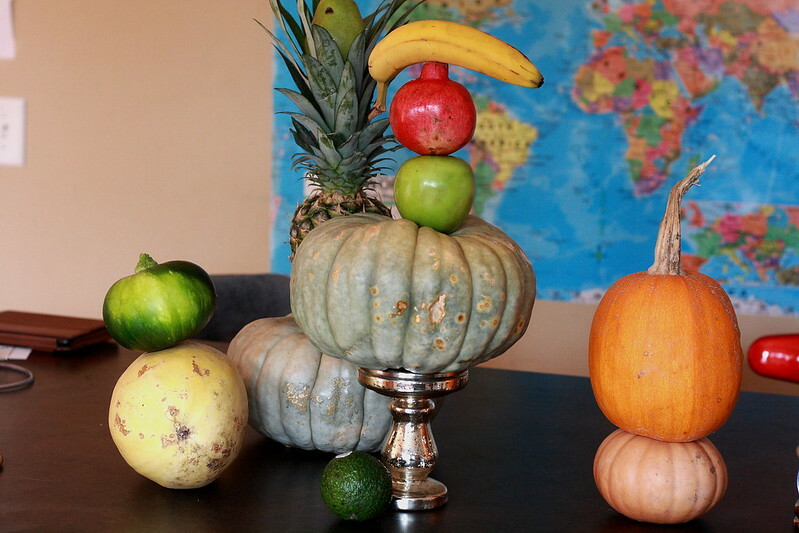 Last fall, I was inspired to decorate my kitchen island with a blue pumpkin. But it wasn’t quite right — my island needed something with a bit of height. After some trial and error, my blue pumpkin perched on a pedestal. And I was happy. 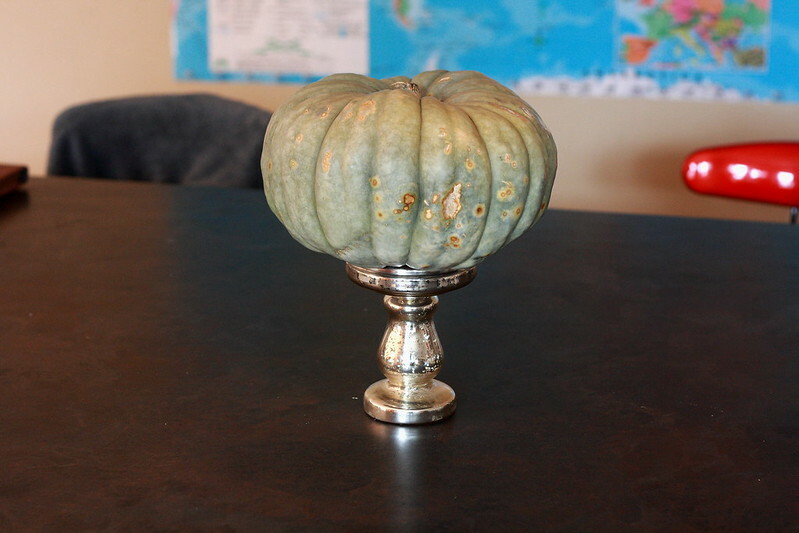 My very practical husband and sons laughed at my pumpkin perched on a pedestal. This little peaceful vignette didn’t last though. When I stepped out of the kitchen, I would come back to find that someone had messed with my pumpkin perched on a pedestal. This year, the tradition has continued. After I searched everywhere and came up empty-handed, Sid finally found a blue pumpkin for me at Tractor Supply. I happily retrieved my pedestal from a high pantry shelf and created my little peaceful vignette on my kitchen island. Then I left the kitchen and returned to this . . . . . .
My pumpkin on a pedestal decor is a silent, teasing conversation between the kids and me. I clear away their additions, leaving my pumpkin in peace. When my back is turned, they add a little silly to my vignette. They are creatively stretched, finding new and interesting additions — something sure to catch my eye and make me smile.